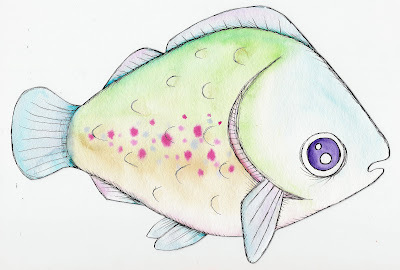 Here we have another watercolored fish. This one's much fatter than the other two! I kind of want to go on a painting frenzy because there's a set of watercolors I really want... Anytime Geninne gets something new, I just WANT it because she is my biggest art hero. Well, the new watercolor set is $259.00, sooooo I'll have to be really patient for that one. But can you imagine the colors?!!! your fishies are sooooooooo cute! I love this one the most! Also thanks for sharing the linkto geninne's blog! I'm totally blown aways!!! Ocean Themed Loaded Charm Bracelet!